Heroes' Day is a national holiday in Kenya, that annually falls on October 20. Before 2010 this holiday had been known as Kenyatta Day and it honored late President of Kenya Jomo Kenyatta. Every year people of Kenya had observed Kenyatta Day in honor of President Jomo Kenyatta. 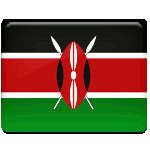 But in 2010 Kenya adopted a new constitution, that brought changes to numerous national holidays. It replaced Kenyatta Day with Heroes' Day (Mashujaa Day in Swahili) and it commemorates the heroes of the nation, that gave their lives for independence of Kenya. The heroes of Kenya are people who belonged to national movement Mau Mau. The movement started in 1948. On October 20, 1952 it staged an uprising and the state of emergency was declared in Kenya. The state of emergency was lifted only in 1960, although Dedan Kimathi, the leader of Mau Mau, had been arrested and killed in 1956. In 1963 Kenya gained independence and the leaders of Mau Mau movement became national heroes in Kenya. They are annually commemorated on October 20 by all Kenyans.